In 2008 Death Cab For Cutie released Narrow Stairs, and while it’s undeniably their darkest effort to date, it is also their strongest. Even deceptively jolly sounding songs such as the organ-heavy march “You Can Do Better Than Me” are overwhelmingly pessimistic, starting with the oh-so-cheerful lyrics, “I’m starting to feel, we stay together out of fear of dying alone.” “Your New Twin Sized Bed” is another deceptively poppy song about a man who finally throws his queen size bed away after coming to terms with the fact that he’ll never find a love to occupy it. After years of penning songs about heartbreak, loneliness and mortality, chief songwriter Ben Gibbard and the rest of the group have finally changed their tune on their latest album, Codes & Keys. Perhaps falling in love with and then marrying indie-darling Zooey Deschanel – as Gibbard has just done – will do that to you. Right from the start, Codes & Keys exhibits a different Death Cab. In interviews, the band stresses how the album focuses much less on guitar and this is evident in opener “Home Is a Fire.” On this track, Gibbard sings softly over a Pink Floyd-“On The Run”-esque backing track. There is an undulating machine-like presence to the song with the fluttering high-hat, muddy keys and occasional random computerized sound. The guitar is practically a non-entity and sets the tone for the rest of the album. However, “Codes & Keys,” the album’s second song, would be a better introduction to the band’s new sound. Driven by rolling piano and drums and lighthearted strings, “Codes & Keys” is a fun, quick and catchy number that shows the lighter side of a spiritually rejuvenated Death Cab. “Some Boys” is next. A beating kick drum, heavy breathing and airy Cold War Kids-esque “oooooohs” fill your speakers before Ben Gibbard’s distorted voice and Jacon McGer’s constant high-hat take over. Once again, driving and spiking piano and drums fuel the song, providing it with anticipation for a looming danger that never quite comes as the song ends abruptly. 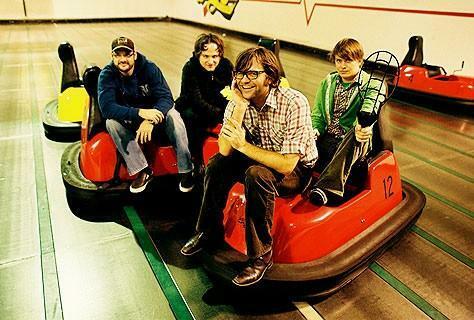 The album’s strong first half continues with “Doors Unlocked and Open.” The song’s trancelike first half harkens back to Death Cab’s great eight-minute number, “I Will Possess Your Heart,” with its robotic bass drum and bass guitar. When his vocals kick in, Gibbard sings as if under rippling water, which adds to the track’s pleasant daze. What follows is the album’s first single and arguably its catchiest song, “You Are a Tourist.” More guitar heavy than most on the album, the song shines with bright drums and an incredibly catchy guitar while chord heavy piano shimmers in the background. “Unobstructed Views” comes next and almost ruins the moment of catchy tunes that Death Cab established with the last four sounds. It is a dull three minutes of machine-like piano and computerized sounds followed by three minutes of the same supplemented with vocals. “Monday Morning” and “Portable Television” make up for the dud and return the album back to glory. The former (a song that sounds like the cheerful cousin of The Antlers’ “Two”) somehow turns the line, “Night is gonna fall and the vultures will surround you” into a cheerful chorus whereas the latter is a danceable number almost reminiscent of Okkervil’s River’s “Lost Coastlines.” Like so many other songs on the album, these two tracks are just plain catchy. It’s fitting that “Stay Young, Go Dancing” is the album’s last track, as it’s further from Narrow Stairs than any other on this record. It’s a love song plain and simple, no doubt inspired by Gibbard’s new bride. Starting with “Life is sweet,” Gibbard later goes on to sing, “Cause when she sings I hear a symphony” and “with her song in your heart it can never bring you down.” Is this his proclamation that he’ll never be down again? (I’m sure he’s bummed about ridding himself of his queen-sized bed however…) Well if it is, we can feel secure in knowing that even when Ben Gibbard and co. aren’t descending into depression, Death Cab For Cutie can still produce quality music. At first listen to Codes & Keys, it seemed there wasn’t much differentiation between songs and found the album to drag a bit, never really advancing from a muted sonic plane. However, after each listen I began to appreciate the individual songs more and more, picking out their subtle differences. No, there isn’t a standalone hit single in the record, but practically every song is catchy or interesting in its own right. While I still think Narrow Stairs is a better record, I don’t think Codes & Keys should be scoffed at for being a “lighter effort.” It should be certainly interesting to see where Death Cab For Cutie goes from here.